i whispered the words over and over, linguistic rosary beads, carrying me, i hoped, to the land of calm. the moving truck was three days late getting here, with a good dozen phone inquiries left unanswered. day after day, promises crumbled, as we did our best to wait it out in the empty law school apartment, stitching in walks and slices of new haven pizza. finally, wednesday morning, we caught sight of the squat little van veering for the curb out front. we waved, as if greeting a long-lost cousin who’d just crossed the seas. and then the driver loped out from the cab, a man on a mission we didn’t yet understand. “who’s in charge here?” he barked. i pointed to my firstborn, the kid whose worldly belongings were stashed inside that moving vault. or so we hoped. “your bed’s cracked in half, and your desk, too,” he informed. we stood motionless, taking it in. these sorts of words seem to take the slow road to absorption, words you’d never expected. somewhere deep inside i thought, “well, at least they’re here,” seeing as i had visions of that vault of worldly possessions taking a jaunt aimlessly around the globe. in perpetuity. then they started to unload. first off: book cases. or rather the remains thereof. shards of bookcase, more like it. then the antique floor lamp. its black metal post with the golden finial, snapped off, never to be seen again. dear moving man assured us it was all that way when he’d picked up the load not too far away, earlier that morning. bad packing, he explained. really bad packing. seems whoever packed the load defied all laws of physics. maybe it was a science experiment. in case the packer is out there somewhere, here’s what he should write in his lab report: it didn’t work. heavy objects crush lighter ones every time…. 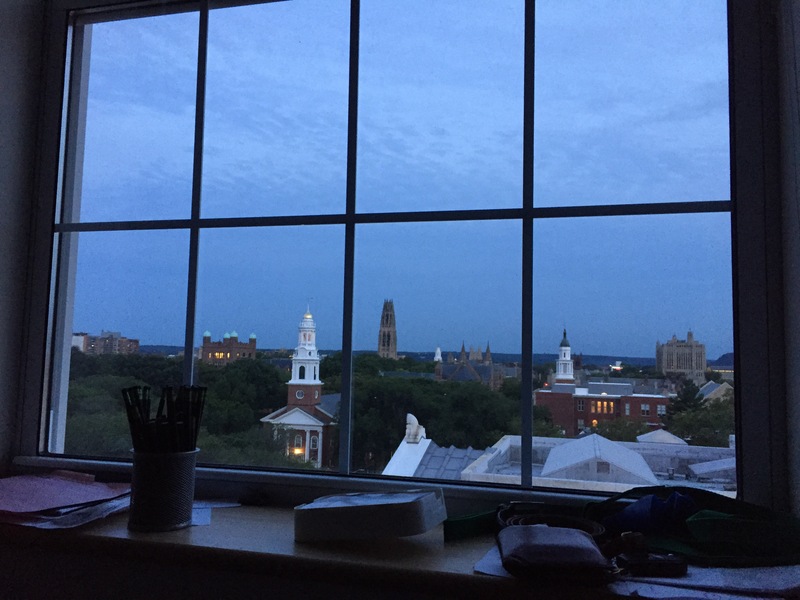 as if all that wasn’t quite enough, last night we got the introductory tour of the yale-new haven medical center ER when we ambled over with a soon-to-be legal scholar who, after trying to move a coffee table out of the movers’ way, found himself unable to walk. or sit. or roll. he’s home now, sleeping right beside the spot on the floor where i’m curled up tapping on a screen. we raced to the five-minutes-away IKEA and scooped up a replacement desk and two bookshelves (silver lining, the bed turned out not to be cracked in half, so that stoppage of my heart was in vain. hallelujah). so, all in all, all will be well. soon as i ditch the fever that’s been haunting me all week…. hoping your week has been infinitely more glorious. and so grateful that today i’ll be sliding hundreds of books onto shelves…. what are the words you whisper when you discover yourself wedged in a tight spot? photo above: view out the apartment window at dawn, as I whispered my morning’s meditation…. sometimes in summer you merely want to dip your toe into the puddles. or the very cold lake. a little of this, a little of that. summer, it seems, is by definition the season for idling. no deep exertion needed. nor called for. and so this week, with our old house bustling, and me trying to squeeze in any minutes of writing time i can muster, we bring you a little of this, a little of that: a poem, the “world’s best” no-bake upside-down cloud of sweet summeriness, and a roundup of books for the summery soul. From West Wind: Poems and Prose Poems, by Mary Oliver. Published by Houghton Mifflin Co., Boston. Copyright 1997 by Mary Oliver. in fact, that might be all the morsel you need for this day. a morsel that’s as much a prayer as a poem, in my book. truth is, the poems i love best are the ones that work as a prayer: spiraling deep down under the hard shell of the everyday numbness, stirring, rustling, awaking the sleeping bits of the soul. the bits that long to be fed, plumped, removed from their starvation diet. have you felt the immeasurable of late, did it touch the buckle of your spine? you’ll need a loaf pan, lined in plastic wrap. stir vanilla (or almond) extract into your bowl of whipped cream (psst: i used cool whip). this is all about layering, so begin with a few plops of whipped cream at the bottom of your loaf pan. next, lay down a row of belgian buttery crisps. press gently into the bed of whipped cream. add a layer of whipped cream, dropping in dollops, and smoothing with a spatula. add raspberries and white chocolate chips (or dark chocolate chips, or almond slices, if that more emphatically tickles your fancy). begin again with your belgian cookie brigade, then whipped cream, then more berries and white chocolate chips. repeat one or two more times, till you’ve reached the tippy-top of your loaf pan. then begin your berry art. i made a flag, or an impressionist rendition thereof…..have at it. cover with plastic wrap, and tuck in the fridge for eight to 12 hours. theoretically you flip the stacked loaf onto a serving plate (thus, the plastic wrap lining the loaf pan), but i didn’t think about that when i went with my flag, so we served flag side up, and jani didn’t seem to mind. there were two slices left for the very next day. and jani proclaimed it even better after its long night’s nap in the fridge. and finally, as promise, the latest roundup of books for the soul. my latest assignment from the chicago tribune. this time: Islamic Jesus, Jewish holidays, and exquisite poems infused with Chassidic sensibilities. so there you go. do as summer insists: savor these lazy days. and if so inclined, tap out your thoughts to the question above, the one about the immeasurable. or share your favorite no-bake summery sweetness. or the books whose pages you’re turning these steamy days of july….